Coastal Triathlon: The most exciting coastal activity you can do in Wales. Book our Coastal Triathlon for your stag party, hen party, friends or company. 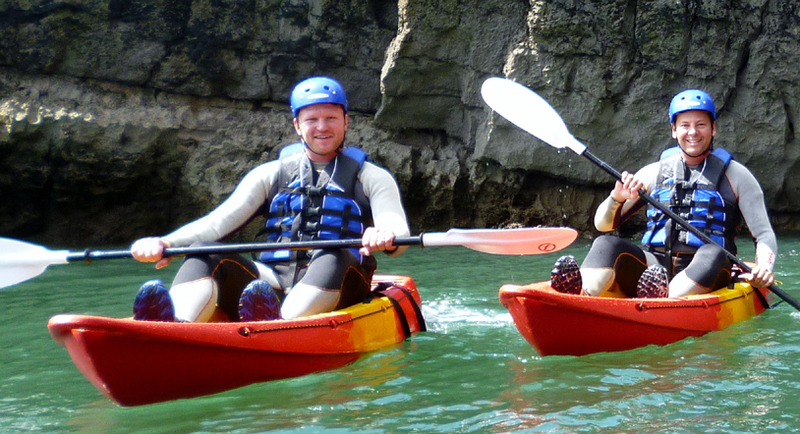 We operate at the Gower and Pembrokeshire in Wales so give us a call for an amazing experience. 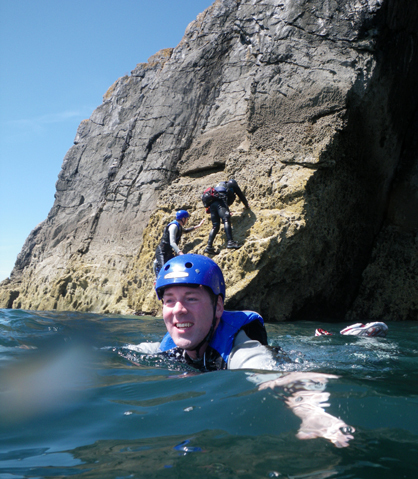 If you are after the ultimate coasteering adventure then our Coastal Triathlon will be what you are after. 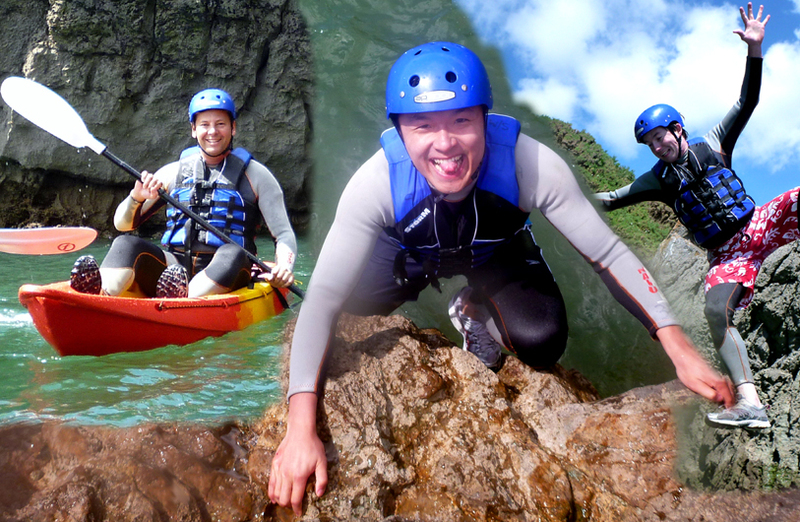 We have combined three of the most exciting, adrenaline pumping water based activities into one incredible session. Surf around the coast with our amazing sit on canoes, swim through sea caves, out to small islands and around bluffs to secluded coves and finally scramble up the cliffs with huge jumps into the sea at the top. If that is not enough adventure we can also make it competitive with each section being scored for a grand prize giving at the end of the day. Feel at one with the waves as you paddle around the cliffs with nothing but a wetsuit between you and the waves. These lightweight plastic canoes are easy to paddle, really tough and with no cockpit you just have to step off to get out. Amazingly maneuverable and stable you will be sea canoeing like pros in a very short time. 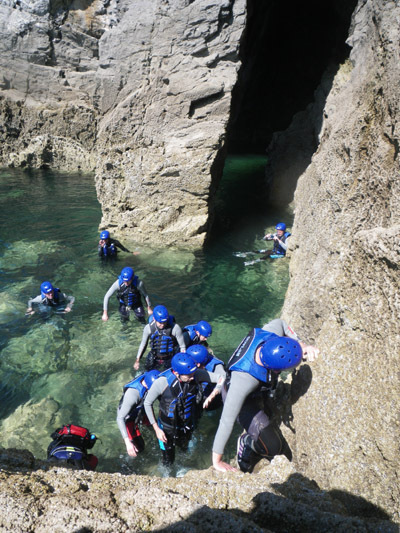 Swimming with your friends is the best way to explore all that the welsh coastline has hidden away. We can duck dive into secret caves, swim through steep rifts of rock and out to isolated islands. You also have the swell and waves to deal with and we will teach you how to use the power of the waves to push you out of the water when you come to climb out again. Once you have got the hang of things we then move on the the climbing, scrambling and jumping part of the session. We have some areas where we go deep water soloing which can get very competitive with everyone trying to beat the height that the last person climbed to before they fell off. We also go scrambling along rock slabs and up sea spikes where we do the jumps. We start from just a few feet up and get progressively bolder. How high will you go? 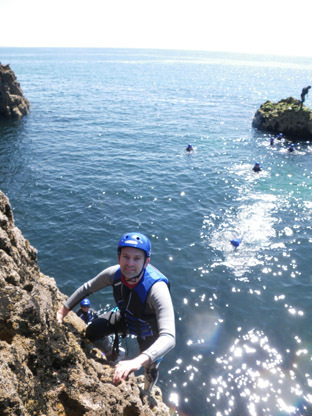 All our instructors are highly qualified with an enormous experience of coasteering, climbing, surfing and canoeing so you will be in very safe hands. We also tailor every session to suit the group so if you want to do more of one activity, say canoeing, then they will take you on a longer more varied canoe trip, we a very flexible. To book just email or ring and we will reserve a session for you and your friends. Contact Michael to discuss your requirements and get a personal quote. Amazin!! Thanks for a great Stag Day out, the lads thought it was fantastic. Our thanks to the other instructors for their enthusiasm and humour. Just wanted to pass on my thanks to yourself and the instructors for the gorge walking on Saturday. Everyone had a great time - the extra rain really made the gorge walking a lot of fun and it certainly cleared everyone's hangover from the night before! Many thanks once again.